Verona is perhaps best known as the city which serves as the setting for the romance of Romeo & Juliet. It is renowned for its historic architecture and Roman amphitheater. If one consults a map of Allegheny County, the next large municipality to the east of Verona is: Oakmont. 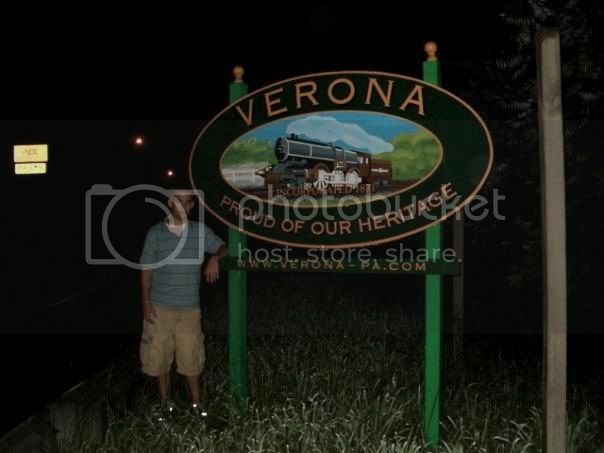 Luke Ravenstahl's midnight ride to see Tiger Woods at the US Open probably took him through Verona. Here, Brendan poses in front of an attractive sign. Verona proudly protects its heritage. The train pictured is the same train that carried William Shakespeare to Verona years ago to preview it as a setting for "Romeo & Juliet". 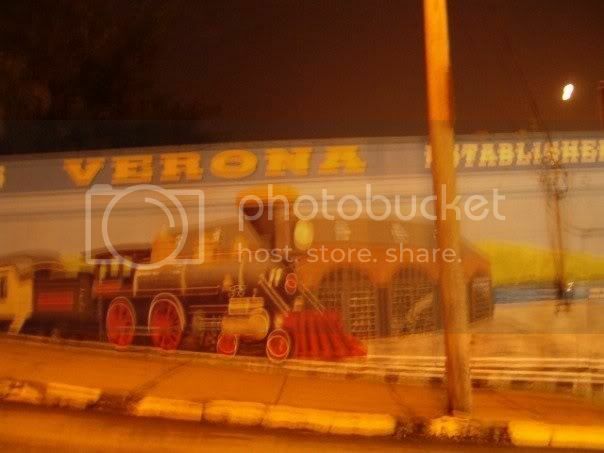 The poor image quality here is because it was taken without a flash at a red light on a somewhat foggy night at 12:30 AM. An excellent mural is quite an imposing sight. It rivals perhaps the large, lighted Wilmerding sign as the most interesting of Allegheny County images visable on the roads.